You must insure your foreign employees working in Finland in the same way as your Finnish employees. You are a Finnish employer. Your employee lives in Estonia but works in Finland. Your employee spends the weeks in Finland and the weekends in Estonia. You are to pay the statutory contributions for your employee to Finland. If your employee works in several countries, it is easiest to insure them in only one country. If your employee has employers abroad, your employee may have to be insured in some other country than Finland. In that case you have to pay all statutory contributions for your employee to that country. As a rule, your employee is to be insured in the country in which they live and do a considerable part of their working hours. The country in which your employee is to be insured will issue an A1 certificate to attest that they are covered by the social security laws of that country. In practice, you have to pay all contributions for that employee to the country that issued the A1 certificate. You are a Finnish employer. Your employee lives in Estonia. He works for you two days a week in Finland. In addition, he has an Estonian employer, for whom he works three days a week in Estonia. Your employee applies for an A1 certificate from Estonia. Both you and the Estonian employer pay the social security contributions for your employee to Estonia since he lives there and does a considerable part of his working ours there. The rules for earnings-related pension insurance apply to asylum seekers, as well. You have to insure asylum seekers that you have employed if the employment meets the requirements of the earnings-related pension acts. You have to insure the asylum seeker that you have employed even if they have not yet been granted a residence permit or a personal ID code. As a rule, an employee working in Finland is insured in Finland. However, employees posted to Finland on a temporary basis form an exception. Such an employee is covered by the social security of the sending country, and the insurance contributions are paid to that country. 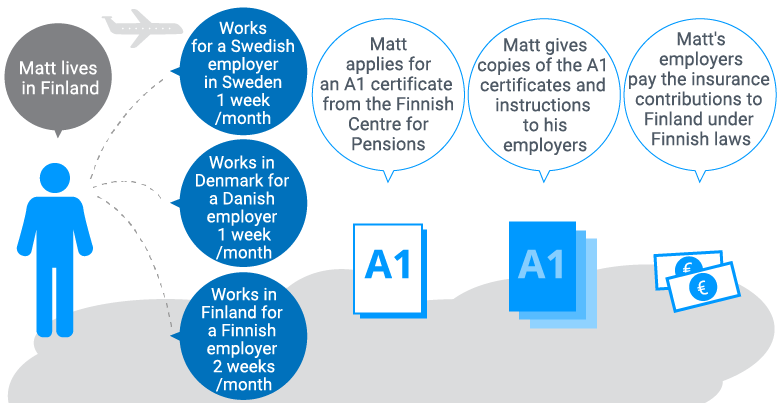 If you post your employee abroad, you have to apply for an A1 certificate for your employee before they start working abroad. When you employ a foreign employee, find out if they have been posted and if they have an A1 certificate. If they lack such a certificate, you are to insure the employee in Finland. An employee can be posted for two years. If the work abroad lasts for a longer period of time, you have to insure the work in Finland. The employee lives in Estonia. He has an Estonian employer, for whom he works in Finland at a construction site. All contributions are paid to Estonia. His Estonian employer applies for an A1 certificate from Estonia before he starts his work in Finland. Pay the Finnish statutory contributions for your foreign employee. If your employee has an A1 certificate, you are to pay the contributions to the country that issued the certificate. As your employee if they have other employers. That can determine the question of to which countries the contributions are to be paid. Find out which contributions the laws of that country require you to pay and how much your have to pay (for example, Maksu- ja tolliamet in Estonia). must be presented to the employer before the work begins. The employer posting employees abroad applies for the certificate for the employees. If an employee has several employers, the employee has to apply for the certificate themselves. Contact the Estonian tax authority (Eesti Maksu- ja tolliamet). Fill in form R2 and attach an extract from the Finnish Register of Companies. If you use a representative to take out insurance (for example, the Estonian employee), make sure the representative has an authenticated power of attorney. If you send the documents by post, they have to be authenticated. Opening hours: weekdays 8 a.m. – 4 p.m.